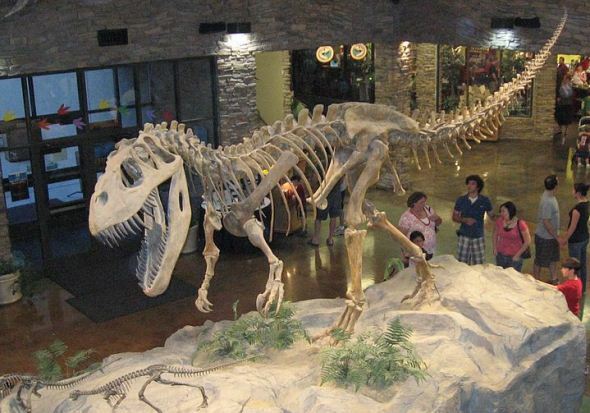 The Torvosaurus is a 1971 discovery by Delta rockhound Vivian Jones and her husband, Daniel, in the Dry Mesa Quarry about 20 miles southwest of Delta. The dinosaur was named and described by paleontologists James Jensen and Peter M. Galton in 1979, chiefly based on upper and lower arm bones. The Torvosaurus is related to the Megalosaurus, which dates back to 1676 in England and may be the first dinosaur to be described in scientific literature. The meat-eating Torvosaurus reached 36 feet in length and 2.2 tons in weight, which made it one of the largest carnivores of the late Jurassic period. It walked on its hind legs but with its body parallel to the ground much as the Tyrannosaurus did. It had a relatively large skull and short arms. The description is limited because an entire skeleton has not yet been found.